It’s not surprising that most classic recipes are built on the solid foundation of good old-fashioned country cooking. 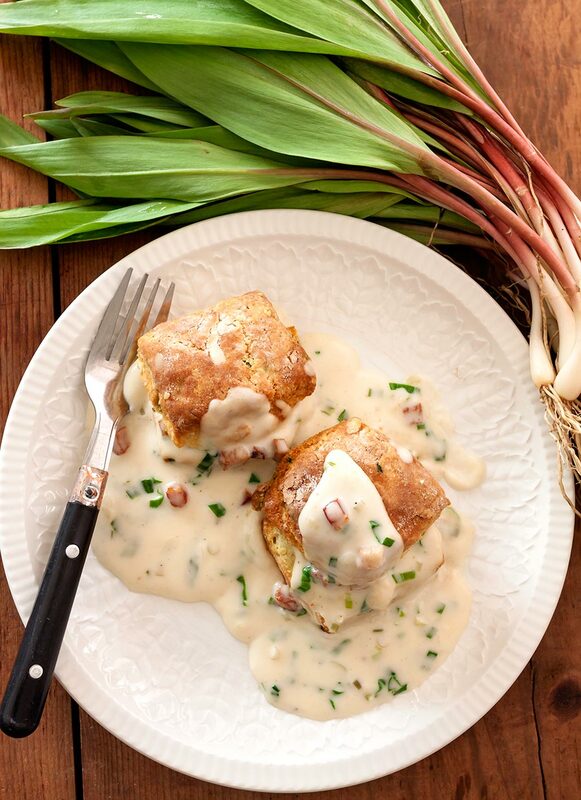 Ramp and Jowl Bacon Gravy is insanely good over hot, homemade biscuits (check our recipe for Ramp Buttermilk Biscuits), but would be equally at home gracing a roasted veal chop in a fancy white-tablecloth restaurant. No wonder that down-home ingredients like ramps have found their way onto the menus of so many upscale dining establishments! A spoonful or two of this rich, velvety-smooth sauce will transform simply cooked meats and fowl like chops, steaks or roasted chicken, adding the richness of cream along with the untamed flavor of wild ramps and the smokiness and pleasing texture of jowl bacon. For the uninitiated: regular bacon and jowl bacon may look very much alike, but there are some significant differences. Regular bacon is made from the belly of the pig; jowl bacon comes from the pork cheek and jaw. Regular bacon has an approximate 1:3 ratio of meat to fat, whereas jowl bacon is meatier, with a ratio of about 1:2 ratio of meat to fat. 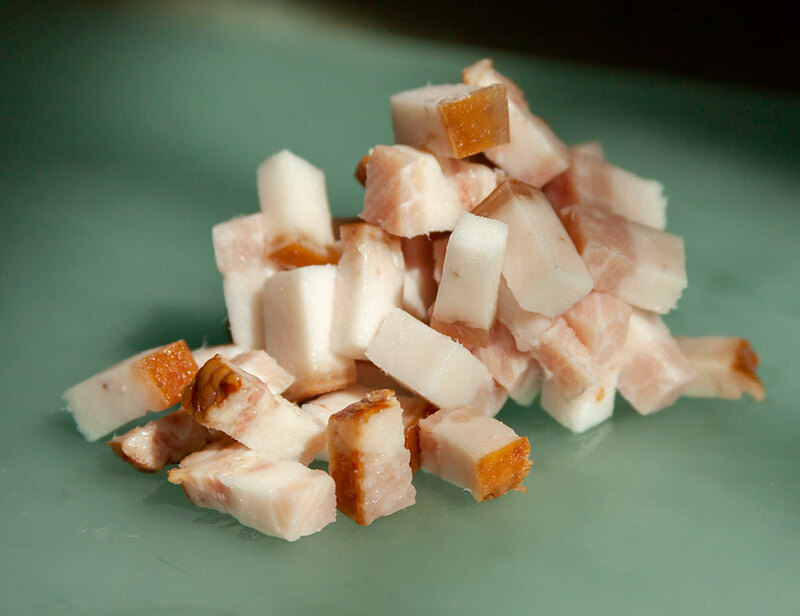 Jowl bacon is a little bit firmer, giving it more resistance to the tooth and a pleasant, slightly chewy texture. A roux (pronounced “roo”) is a classic way of thickening sauces or soups. For a fairly thick, gravy-like sauce, the proportions are about 1:1:1 – in other words, 1 tablespoon flour to 1 tablespoon of fat to 1 cup of liquid. You’re essentially cooking the flour in fat to form the base of the sauce. The color of the roux (and some of the flavor) depends on the length of time that it’s cooked. You’ll find that the roux can brown quickly, so stir constantly and have your liquid ready. In this recipe, we are looking for a light, ivory sauce, so the flour will be cooked to a pale, golden brown before the liquid is added. There you have it; whether you call it a gravy or a sauce, this simple, sure-fire recipe is a must-make during the all-too-short fresh ramp season. As rich as it is, don’t skimp when ladling it on. It’s just too good to pass up. Wash the ramps thoroughly under cool running water. Pop off the roots and “button” and slip off the pulpy capsule, if it’s still there. Pat dry and cut off the ramp greens right at the top of the stem. 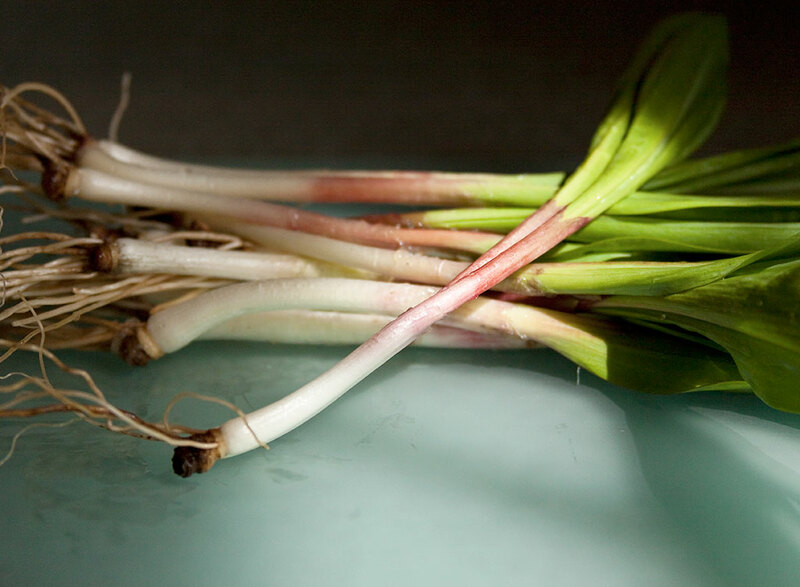 Slice the ramp bulbs and stems thinly, then coarsely chop the green tops, keeping them separate from the bulbs & stems. Set aside until later. Melt the butter in a heavy-bottomed pan over medium heat and add the diced jowl bacon. Cook until the fat has rendered and the edges of the bacon are browned, about 3 – 5 minutes. Stir in the flour and cook over low heat, stirring frequently, until bubbly and golden brown, about 5 minutes. Stir in the sliced ramp bulbs and stems and cook for a minute longer. Whisk in the chicken stock and cream, and reduce the heat to low. Simmer, stirring frequently, until the mixture thickens to a smooth gravy-like consistency, about 10 minutes. Season with a generous amount of freshly ground black pepper and salt to taste. Stir in the sliced ramp greens and ladle into a gravy boat or bowl. 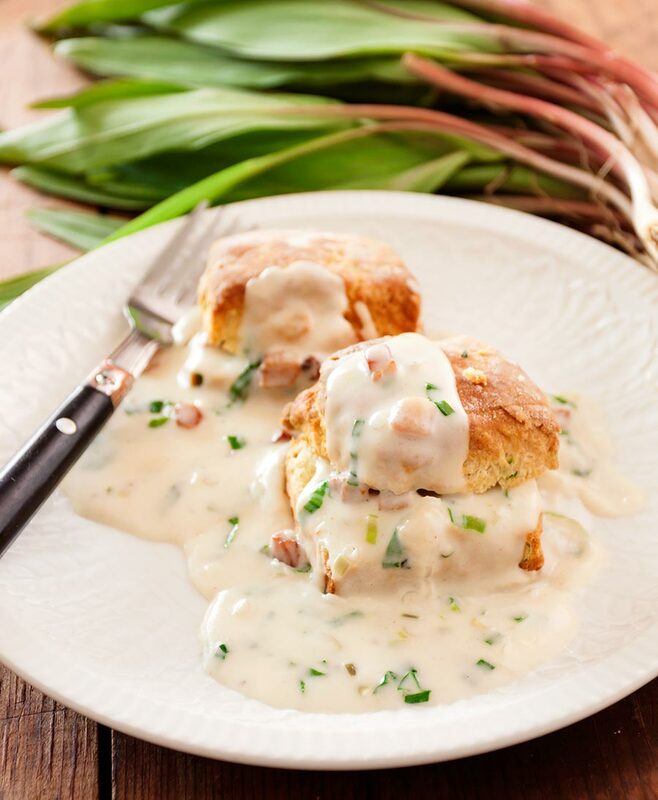 Serve immediately, pouring generously over hot biscuits, pork chops, roasted chicken or mashed potatoes.